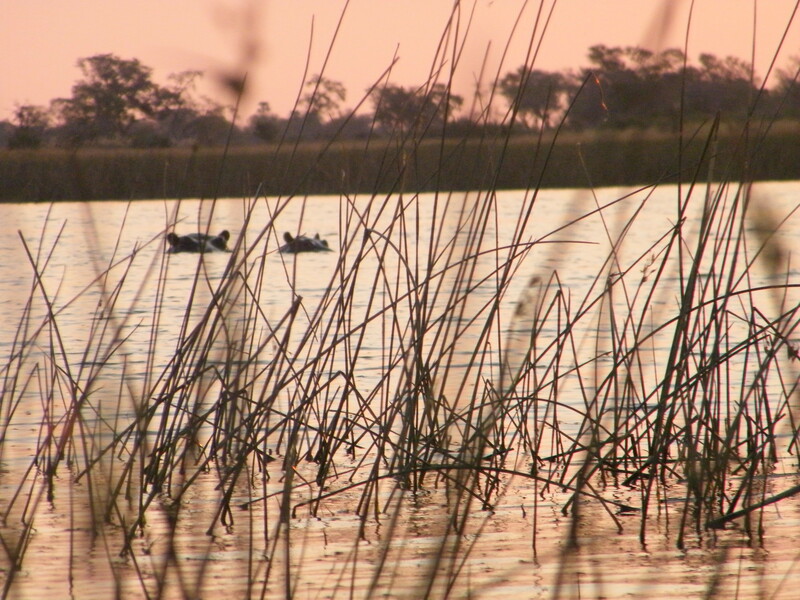 …that was my sneaking worry as we headed toward the Okavango Delta, clutching the single bag of worldly possessions that we were permitted to take with us on our overnight stay. The Okavango is a wild, sprawling wetland in Botswana and popular stomping ground for cantankerous hippopotamuses – one of the most dangerous animals in Africa. 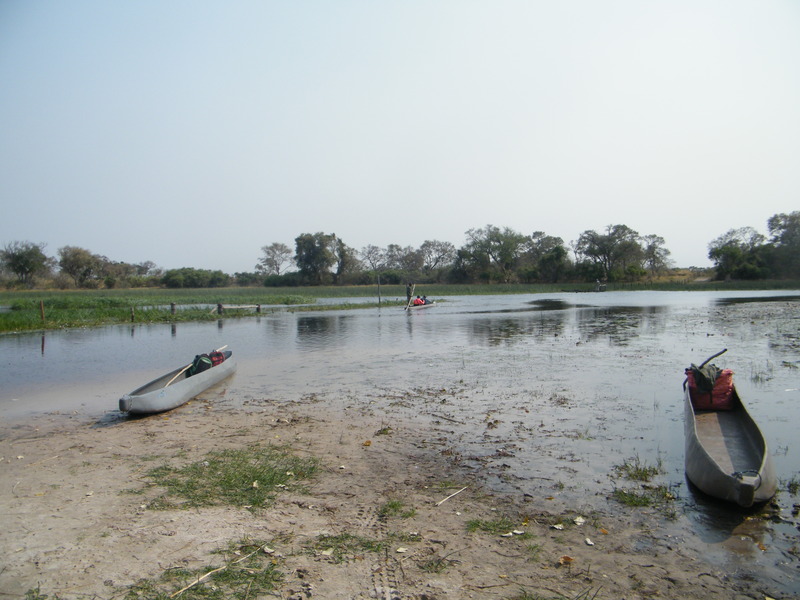 The reason behind the luggage restriction was that all our bags and camping equipment had to fit on to the small fleet of mokoros – the distinctive canoes that locals use to ferry visitors around the delta. So lightly did we pack, that the only set of clothes we took were the ones already clinging to our backs with sweat. As I bundled my rucksack into one of the canoes, I tried to picture being marooned here. It felt like an episode of ‘The Island’, where Bear Grylls blithely deposits a boatload of people on a deserted beach to survive in the wild. In all fairness, the mokoro polers weren’t actually abandoning us, as they had agreed to be our guides and protectors for the two day trip. Yet as we waved goodbye to civilisation, I couldn’t help but feel slightly vulnerable. 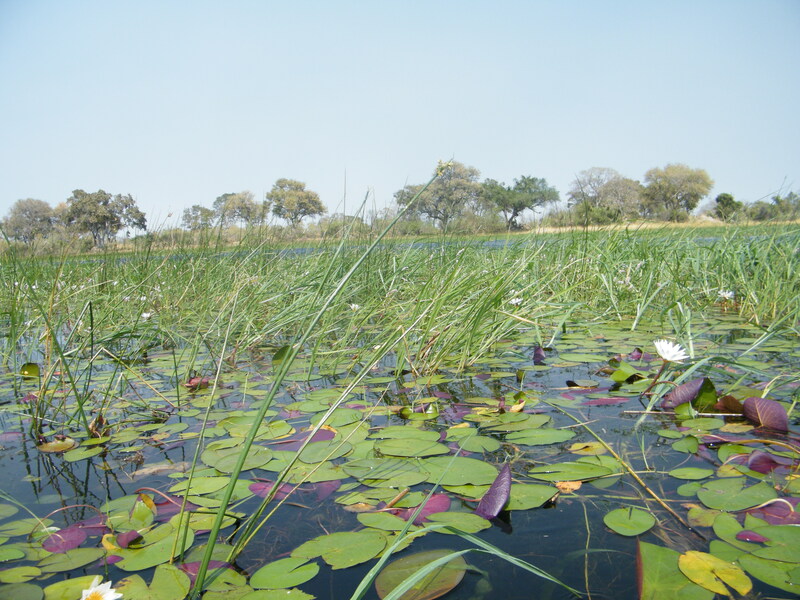 Venice this ain’t – instead of paddling along canals, we navigated channels carved out by hippos, their bulky bodies pushing aside the plant life to create a network of crisscrossing waterways. Fortunately for us, the highly territorial creatures only venture out at night, spending most of the day wallowing in deep pools and sheltering from the sun. It was approaching noon and I could feel the promised heat rising. Using my rucksack as a pillow, I laid back and watched the watery world drift by. Lily pads floated in the glistening delta’s surface, while dragonflies buzzed amid the drooping long grasses. Under the blazing Botswana sun, there appeared not to be a single animal in sight. Eventually we reached our destination, and like pioneers, immediately claimed the island as our own. Setting up camp was a team effort as we all helped carry the cooking equipment, tents and other provisions from the boats. The rules of the camp were quickly explained. How, under no circumstances, were we to wander off by ourselves, lest we have the kind of close-up animal encounter that makes international news. We were also introduced to our bush toilet (a hole dug into the ground) and the novel concept of using a spade as a engaged sign. With base camp erected, we returned to the mokoros for our first walking safari. The polers steered us to another nearby island, surrounded by a sea of swampy grass. We were split into three smaller groups, with instructions to walk in single file and to keep conversations to whispers. Our guide explained that moving in this way would make us seem less threatening to wildlife and thereby increase our chances of spotting something. 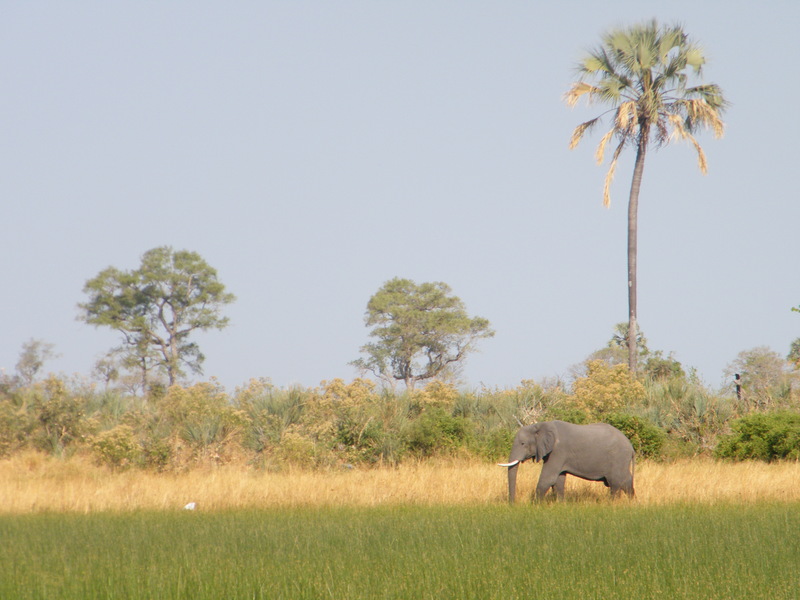 However, no sooner had he finished speaking, did I see my first big mammal – an African bull elephant. I watched in excitement as it strolled through the shallows, pushing the zoom function of my camera lens to near breaking point. This first sighting was good preparation for the gob-smacking close-up we got moments later. Having barely stretched our legs, we quickly stumbled upon a trio of elephants chomping on the local plant life. My breath caught in my chest when I met the gaze of a large male. It was quite unnerving, having a stare out with a creature that enormous and powerful. As it fixed its unblinking eyes on me, I wondered what this clearly intelligent animal was thinking. I breathed a sigh of relief when he returned his attention to his food. As dusk fell, we made our way back to camp, with the mokoro polers leading the way. We paused by one of the hippo pools, watching the bright red sun reflecting in the rippling water. We waited for several minutes, hardly even daring to breathe. Our patience paid off, and we were rewarded by the sight of two hippo heads rising from the surface. Back on dry land, we prepared to settle down for the evening. It was then that our group were informed that if anyone needed to use the toilet, they would have to take a ‘pee partner’. That individual’s job was to watch out for predators that might sneak up unawares on the person answering nature’s call. It was a unique bonding moment, although I made a pretty poor lookout, getting distracted by gazing up at the stars. Once dinner was over, the polers treated us to a silly song and dance that had us all in stitches (if they promise to sing you Botswana’s national anthem, don’t believe them for a second). After an adventurous day, the night was surprisingly uneventful. Having anticipated a herd of elephants marching through our camp, we were left totally undisturbed. Breakfast was prepared on an up-turned mokoro, before we embarked on the second walking safari of the trip. 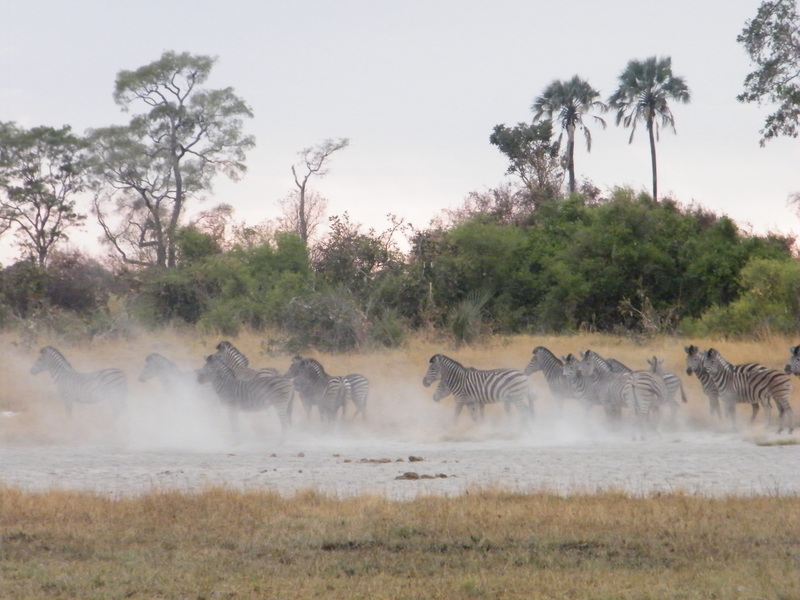 If the first day had been dominated by elephants and hippos, this time it was the zebras’ turn to steal the show. We stood stock-still as a large group of them gathered before us. Soon, they began kicking up dust into the air, as though rehearsing for a David Attenborough documentary. When it was finally time for us to return to the man-made world, I knew this had been one of those standout trips that stay in your memory forever. 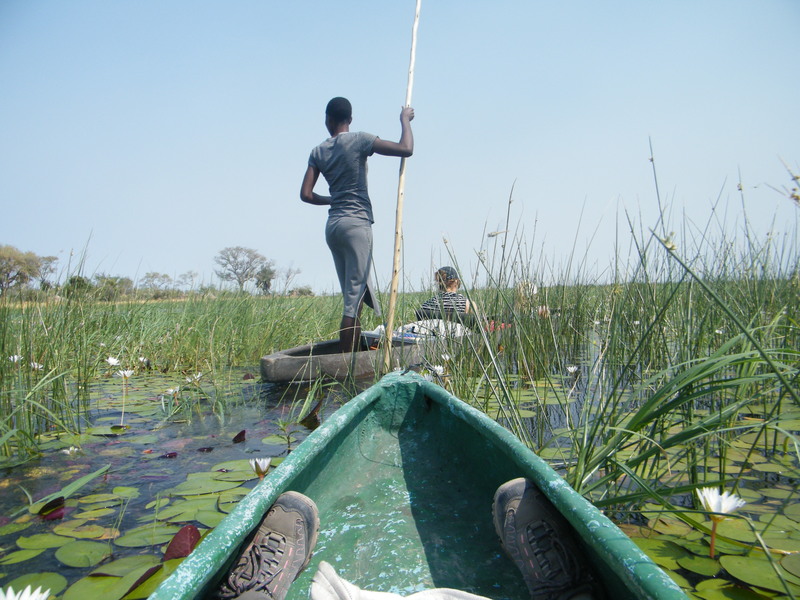 Lying back in the mokoro one last time, I relished gliding through the wild beauty of the delta. 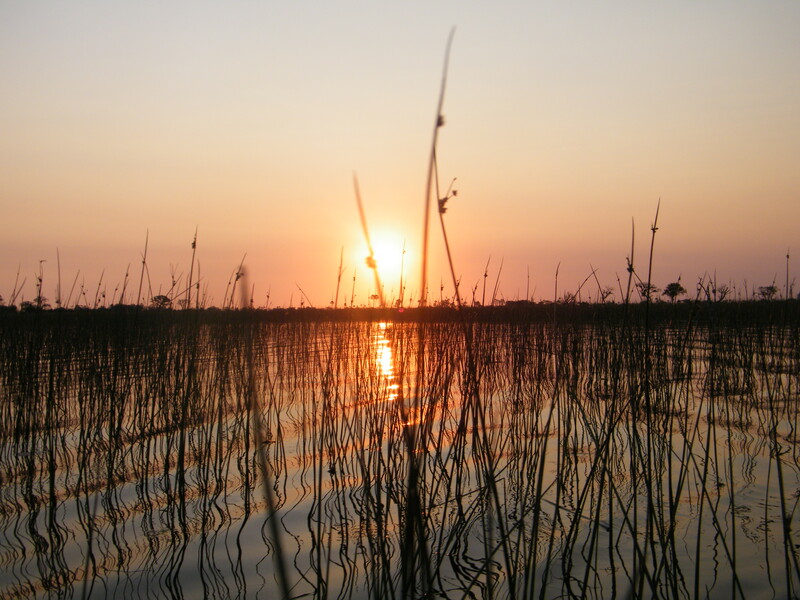 In spite of my initial nerves, I was so glad that I got to experience the Okavango – there really is nothing quite like it.